-in and -out suffixes are now in prerelease. This means you can name both your input and output valley reverb and your JACK patch bay will have a valley reverb-in and valley reverb-out, just like Ardour or non mixer would do. Could be possible add a mute button to each of the channels? It could, but isn’t this what your mixer is for? 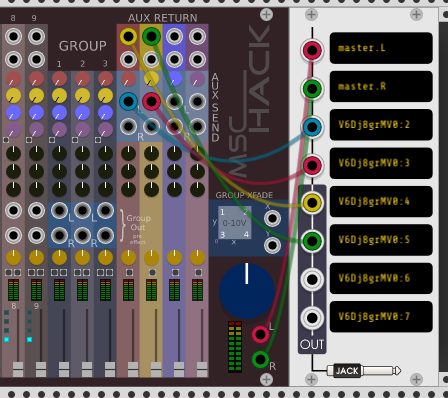 BTW I think a Jack mixer to vcv rack is the next logical step , we (the jack users) happily pay for that. I’m not sure what JACK has to do with this. It sounds like what you want is a mixing console with two-way sync (probably via OSC+UDP or MIDI CCs) between desktops. I complete forget Mutes, that is exactly what I mean, thanks! Thank you, you made an amazing module! My problem is I always get a latency with JACK on windows while working between Ableton and VCV Rack. Even in 32sample buffer. 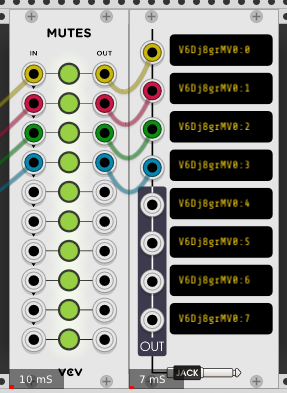 I think that’s something in clock relationship form Ableton to VCV. I use .wav file to clocked CLKd module at the high rate from ableton. This is sad because when I’m using Bridge - everything staying in clock pretty well. Maybe I don’t understand JACK working process in Windows or use some wrong settings. This is sad again because I love the perfomance of your module! 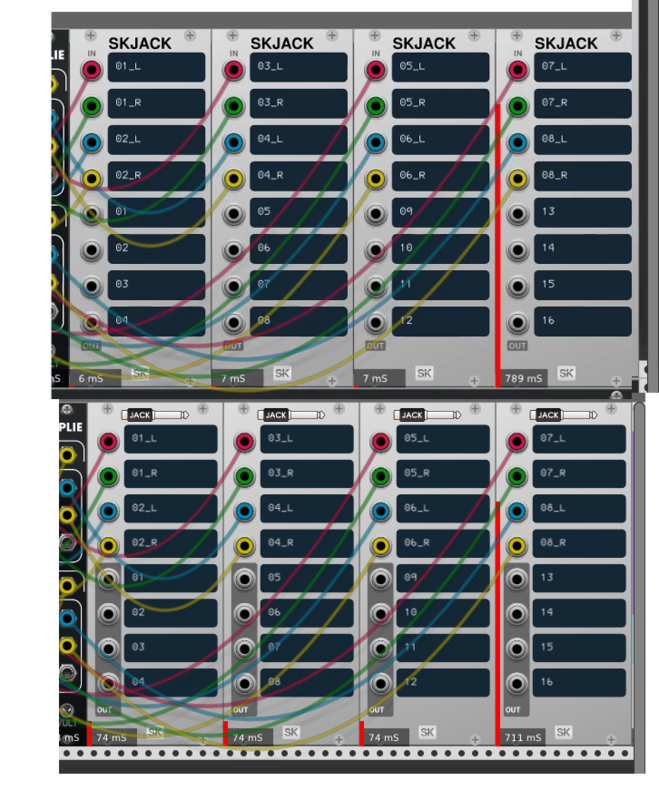 You backend in Windows must be asio inseat of alsa , I used renoise and vcv rack via jack long time ago and it work pretty nice. Ableton does not run there, nor does much of anything. Loomer, Pianoteq, Renoise, Bitwig and emulation layers excepted. My problem is I always get a latency with JACK on windows while working between Ableton and VCV Rack. Even in 32sample buffer. Current version does not calculate and report latency information to JACK, so none of the automatic delay compensation utilities know what to do. Thanks for the answer. Any plans or chance for this feature in the future? 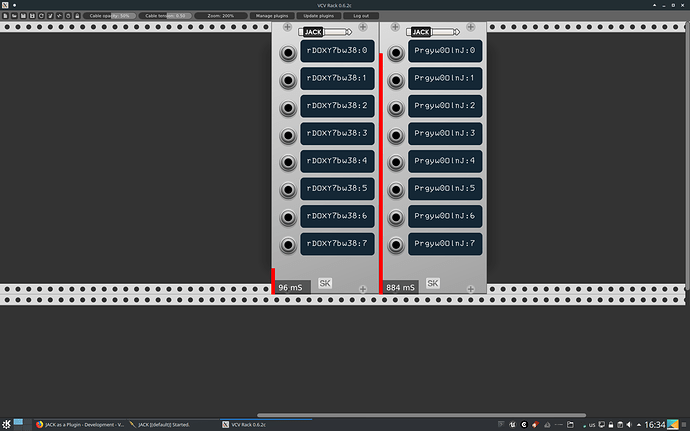 I pushed 0.6.7 of the JACK plugin earlier. Port names have -in and -out bolted on. I did this some time ago but it wasn’t tagged. The manual should be easier to read now. The 8-OUT is finally done. Latency detection and transport control are probably the lowest hanging fruit for another version. MIDI support is a bit of a doozey since there are various note properties and CCs to pack/unpack. is this release available in the plugging manager? Duplicating a module will no longer show port names that cannot be used. The duplicated module will instead show a new set of ports with scrambled names as though you created it from scratch. Renaming a port no longer results in it “disappearing” when typing. We detect that the name you are typing is not valid and instead refuse to update it, so it will still appear in the patch bay by its old name. I suppose this also means those using a tool to append two racks will also no longer be able to have conflicting port names–the appended modules will detect the conflict and re-randomize their names. 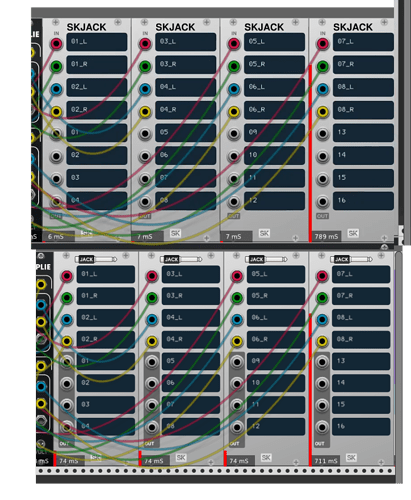 Keep filling up input/output buffers like we are (and as Audio does,) but try to report a full DSP cycle as latency and hope JACK works it out. Shoe in some thread magic so Rack is blocked until a JACK cycle, we can take the input / process it / output it and so we actually show up with “zero” latency. May attempt the first and see how it goes since it requires the least effort. Option 2 might be looked at if option one doesn’t work as well as hoped. 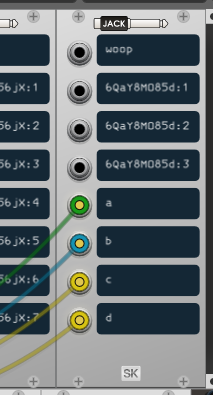 Normally DSP code runs this way (where the interface drives the callbacks, which drives the modules/oscillators, not this weird world where Rack just runs as it feels like and then stalls itself when an output fills up a buffer) but emulating it would require doing a lot of multithreaded debugging to ensure ex. deleting the last JACK module doesn’t cause your instance to seize up.